Today I have another one of OPI's new San Francisco shades to share with you! OPI Alcatraz... Rocks* is a gorgeous new Liquid Sand shade which will be beautiful going into Fall and Winter. I think this polish might just be the stand out of this collection, so pick it up before it's gone! OPI's Alcatraz... Rocks is an absolutely beautiful shimmery purple polish with a nice texture to it. I really like the Liquid Sand polishes because you get the sparkly finish of a glitter, but they are very quick-drying and opaque. I feel like you really need good lighting to see the true colours and beauty of this polish. I painted it on, and was happy, but not overly excited. Then, I went outside and I fell in love with this polish! I decided not to add a top coat, just because I was already happy with the amount of shine. 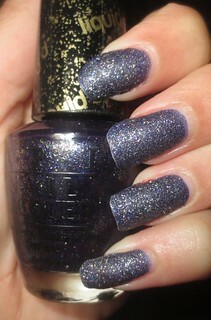 However, you can always add a top coat over top of OPI's Liquid Sand polishes for an extra dose of shine. Alcatraz... Rocks, just like all of the Liquid Sand polishes, have a textured finish. It literally feels like you have sand on your nails, but it doesn't bother me at all. I used two coats of Alcatraz... Rocks for an opaque look. I definitely think that OPI's Alcatraz... Rocks is a stand out in their new San Francisco Collection! Will you be picking up any of OPI's new polishes? I thought I had commented on this but I must have been glitchy when posting :( Anyway I think this is neat but I'm not super in love with textures and probably won't be picking it up, I'm not sure there's any in the san fran collection I really want, though i'll be curious to see swatches of peace, love and opi. I actually don't mind the textured finishes, they're kinda fun :) Peace, Love, & OPI is definitely on my wishlist, it looks gorgeous! Beautiful colour! Do you have any tips to keep the polish looking neat on your nails? I always end up getting some on my skin!